On this episode of Rhodes to Success, I interview Frank Klesitz, who is an entrepreneur, investor, and co-founder of Vyral Marketing. The video marketing firm helps entrepreneurial professionals in all industries increase client generation and retention with education-based video marketing. Viral marketing helps hundreds of professional clients worldwide publish over 800 client videos a month and 4 million client emails per year. 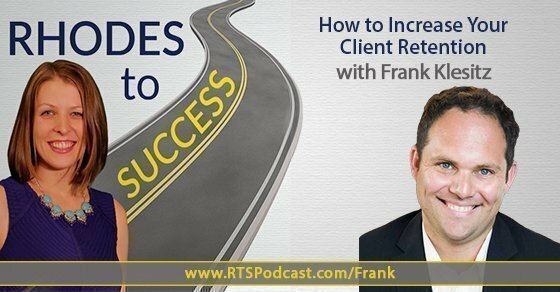 Frank’s methods are directly responsible for generating more than $10M of additional client revenue, commission, and billable hours since 2009. During the show, we discuss the 33 Touch Concept, balancing new clients and client retention, weekly client phone calls and getting people to sign up, and setting clear expectations. Talk about your wealth expertise. How do record via webcam and help people with lighting? How did you take your business from zero to 60 employees? How do you balance brining in new clients with client retention? How are you getting people to sign up to your service? How do you handle setting clear expectations? The 33 touch concept is touching your database 33 times per year with something of value, which works out to be every 10 days. It’s important to be the marketer of what you do and not just the doer of what you do. Vyral Skypes clients and does interviews on a webcam in order to create two videos per month. The video quality you get on a webcam looks pretty great. The only issue is the audio, but it can be fixed with an external microphone. Vyral is able to see the client by doing a Join Me session so they can see the screen. The best topics are 2-3 minutes and are Q&A’s based on the most common questions people have been asking you. The concept of custom work is difficult to scale, so Frank created one system and one plan with a one-time, up-front fee and ongoing monthly fee. Retaining a client is more profitable than bringing in new clients. New client generation is your retention. This needs to be number one on your list as a business owner. You can’t control what clients are supposed to do, such as if they pay on time or want to continue the service. You can never take your eye off the ball when it comes to searching for new clients. The number one thing you can do for client retention is to make sure your clients get a phone call every single week. If you focus on weekly communication, it tends to fix most problems from a retention standpoint. When you start getting things done through others, you have to start leveraging yourself. The only way to ensure the quality of the communication is by training and meeting with your people to go over the issues of communication on what you are dealing with. Fonality allows Frank to listen to any live calls. Frank attends top conferences, and finds the people in the profession who are being put on stage and marketed as the most successful people in the profession. The goal is to get the influencers of the profession as clients by doing whatever it takes. Once they have the influencer on board, they market it back to everyone in the profession. In order to get creditability, you have to get clients that people want to become. There are 40-50 things that are said in this call, which is a step-by-step recorded call. Subscribe to the show in iTunes or Stitcher Radio!